You should always avoid using a ladder on uneven ground, but if you absolutely have to, even up the ground as much as possible before ascending the ladder. Some ladders come with leg extensions that help offset uneven ground situations. Extension ladders have two legs on the ground, and A-frame ladders have four legs on the ground. 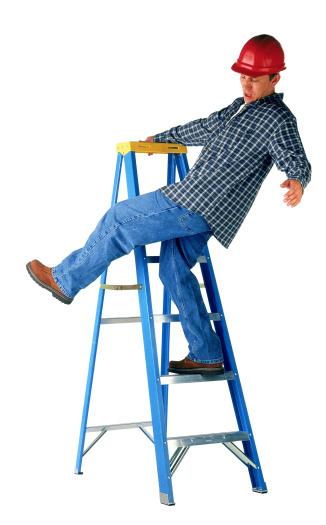 Most ladder-involved accidents can be avoided by making every effort to level the ladder legs. A fall from a ladder can be fatal. Dig the ground with a shovel to make it as level as possible. Dig away high spots and fill in low spots with the dirt taken from high spots. Lay a 12-inch-square board over the leveled area to provide extra stability for the ladder legs. The board is necessary to keep the legs of the ladder from sinking into the softened earth. Invite someone to hold the ladder while you climb up it. Climb one rung, then shift your weight from one leg to the other. This weight shifting will ensure the ladder is stable. If the ladder tips or slides more than an inch, climb back down the ladder and re-level the soil beneath the board. Jump up and down on the soil with your feet to help pack it down. Set the ladder up on the ground and lean it against the structure you're going to climb. If it's an A-frame ladder, set it up on the ground and allow the legs to stand as they may. Look for any legs of the ladder that aren't touching the ground. Slide a ladder chock beneath the feet of the dangling legs until the chock makes contact with the feet. A chock is a wedge-shaped piece of wood. Step up on the first rung of the ladder and shift your weight back and forth to test the stability of the ladder's legs. If it wobbles, get off the ladder and reposition the chocks. Repeat this process until the ladder is completely stable. Ask someone to hold the ladder while you climb it to ensure an extra measure of safety and avoid a falling accident.